Sadegh Zibakalam, a prominent professor of political science, weighs in on whether Ahmadinejad will make a political comeback. Whether Ahmadinejad will make a comeback to politics is a staple of Iranian politics these days. In fact, speculations as to whether he’ll return onto the political stage began to swirl on June 15, 2013, one day after the presidential elections [won by Hassan Rouhani]. The question is whether Ahmadinejad seeks to return to politics. To be more exact, the question is whether he’ll run for president in 2017. My answer to that question is a resounding yes. I believe that if nothing out of the ordinary happens in the country over the next two and a half years and things remain the same as they have been over the past 18 months, he will definitely be a serious contender in the June 2017 elections. His potential candidacy would be more saddening to all principlist candidates than alarming to reformists and the government of Prudence and Hope [Rouhani’s]. His potential candidacy would be more saddening to all principlist candidates than alarming to reformists and the government of Prudence and Hope [Rouhani’s]. By the principlist candidates, I mean, two ever-on-the-scene-present contenders: General Mohsen Rezaei and General Mohammad Bagher Ghalibaf, Dr. Saeed Jalili and less prominent figures such as Haddad Adel Ph.D., Dr. Ali Akbar Velayati, Ali Larijani, Ph.D. and other figures in the principlist camp who may, over the course of the next years, want to run for president in 2017. 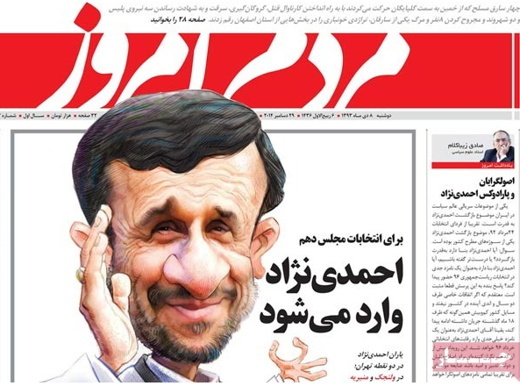 The presence of Ahmadinejad in the field of candidates is likely to increase the odds of principlists winning the vote. Ahmadinejad already has 10 to 15 million votes in impoverished rural areas, and among traditionalists, low-income individuals and those who live on the edge of major cities. Religious issues aside, a small percentage of educated people who oppose the West and its civilization and culture and have found in Ahmadinejad their anti-West protagonist will vote for him too. Another question that arises here is how good a chance he stands of returning to politics. Before fielding that question, a few others need to be answered first. The first one is, “Given that he has made the nation and the principlists go through hell, will they allow him to return?” And the second question is whether they would throw their weight behind him if he threw his hat in the ring. The second question lies at the center of the puzzle of Ahmadinejad’s political comeback. It is a very difficult question to answer. But why is it difficult to guess whether principlists would support him if he entered the race? Because the answer to that question hinges on the commitment of principlists to ethics on the one hand, and their interest in power, on the other. Principlists know well that in the absence of Ahmadinejad they stand a minimal chance of taking back control of the executive branch of the government. Principlists know well that in the absence of Ahmadinejad they stand a minimal chance of taking back control of the executive branch of the government. Even if things remain on a gentle slope, as President Rouhani has put it, principlists do not stand a good chance of winning the vote, unless Rouhani proves unable to untie the Gordian knot of the nuclear talks. In that case, his chances of winning reelection would be slim. But there is evidence he has taken giant steps toward solving the nuclear issue, and in case a final agreement is clinched even further drops in oil prices won’t harm him much. That means, as things are, the principlists’ chances of retaking charge of the executive branch are too slim. Only if they all rally behind Ahmadinejad can they think of reclaiming the presidency. Even in that case, their victory would be far from certain. At least they can hold out hope if Ahmadinejad enters the race, otherwise they are already defeated. Why did I mention ethics? Principlists need to say how far they are willing to go to win back the presidency and how important power is to them. Is it important enough for them to let the country re-experience the nightmare of Ahmadinejad? To soothe their conscience in allowing Ahmadinejad’s return to power, they might blame the “deviant current” for what happened [during his term in office] and suggest that Ahmadinejad is unique. Thank God now that Ahmadinejad has distanced himself from the deviant current, there won’t be any more problems, they may also say. In other words, they justify his return to power. But the bitter fact of the matter is that his return to power would be equal to a principlist decision to brush aside ethics. It will also show the extent of the weakness of the principlist faction whose existence revolves around a single individual: Mahmoud Ahmadinejad.